Hey there. 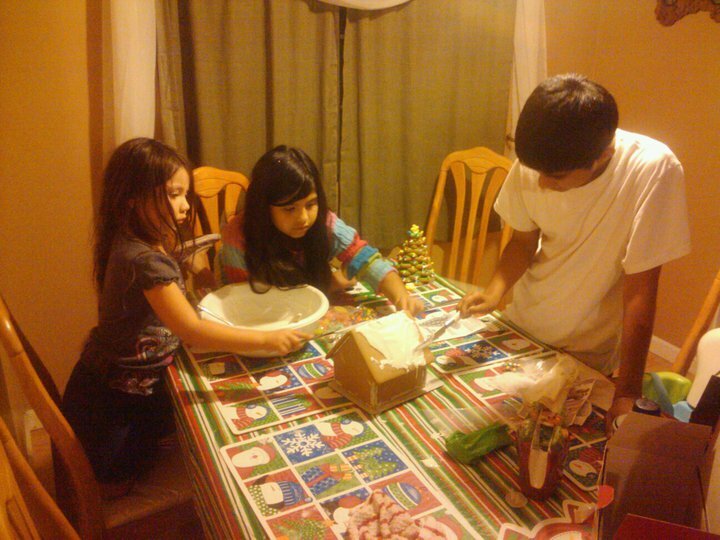 Last night, the family embarked in their first ever gingerbread house. I know, I know. How can it be the first one??? Well, quite frankly, they're hard to decorate so if we bought one, it most definitely had to be pre-decorated! Well, last night we decorated it ourselves. 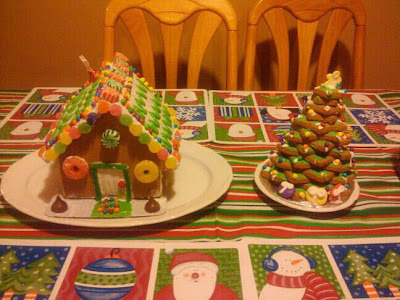 The wife went out and got 2 gingerbread kits. One being the house and the other being the tree. Since the women have better decorating prowess than the men, the girls decided they wanted to do the tree while my son and I did the tree. We all agreed and we set off to our adventure. Me: How you ladies doing? Oldest Daughter: Ok, I guess. I'm just watching. Wife: You're not watching, baby. You're supervising. Oldest Daughter: No I'm not. I'm just watching. All the while, the youngest daughter is sitting there holding the decorating bag of icing and letting it drip into her hand. Me: What are you doing, baby? Youngest Daughter: Nothing, just holding the bag. At this point, the wife figured that the girls were getting bored, watching her trying to keep together the gingerbread house. She asked me to build it because "men are better at building things" which the girls gladly agreed. lol So I stepped in and put together the house and once the icing dried up, let the kids go at it. Instructions? Who needs instructions when you have imagination! After icing, candy, and everything else splattered all over the table, the finish product looks pretty damn good. Check em out. Too bad they need to be eaten! All in all, it was a fun experience. The clean up is a pain, but the kids enjoyed it. Considering that it's our first one ever, not too bad, right? Next time, we'll learn how to do the swirls, icicles, and all the other fancy stuff in the instruction booklet. But until then, we have these delicious looking structures that we built. Later! Aww, so sweet of you and your family..i really liked your Yummy, Delicious gingerbread house..